Warren B. 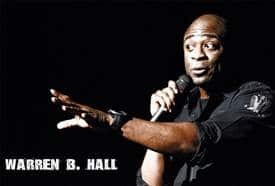 Hall is a full time touring comedian who’s worked every major comedy club in the USA. He’s appeared on the FOX show “Laughs” and on “Comics Unleashed” and at the San Luis Obispo Comedy Festival (which he won in 2012). Warren has also performed for our troops stationed in Iraq, Kuwait and Afghanistan…not once or twice but 5 times! Warren can keep it clean for any corporate event – or other event that requires it.